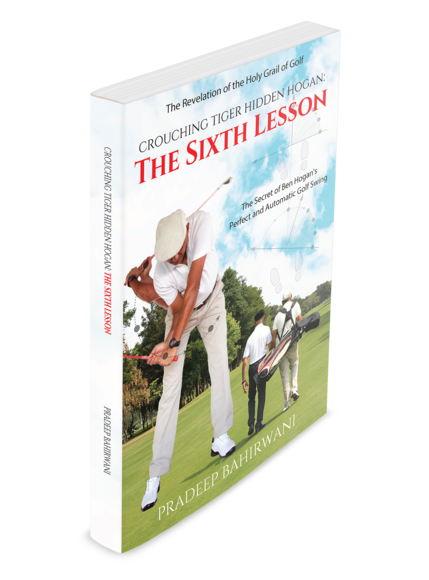 Crouching Tiger, Hidden Hogan: The Sixth Lesson is the revelation of Hogan’s Secret. But it is not intended to be a primary instruction book on his techniques. 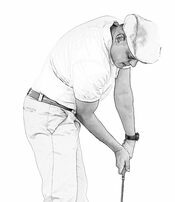 That position unquestionably belongs to Five Lessons: The Modern Fundamentals of Golf. So why read this book? First, it reveals the Secret. Second, it bridges the gaps that have so far held back golfers from successfully implementing the Master’s methods. But the journey starts with Five Lessons. Golfers who have read that book will derive the maximum value out of this one. My natural swing - the one that comes easy to me on the golf course - is not the Hogan swing. The Master himself would have been surprised if it was. My swing is similar to Moe Norman's single plane swing. I learnt it from my Golfing Guru Shawn Clement and further built on it with my study of Homer Kelley’s The Golfing Machine. I was practicing Shawn's Perpetual Motion Drill - a Hands Controlled Pivot drill - at the practice range on a hot summer afternoon. It was pure serendipity that led me to do Hogan's Pivot Controlled Hands drill, the one that was telecast live on the Ed Sullivan show. The purity of contact, time after time, immediately brought to mind the words of the Master : "Clutch your sides with your elbows and visualize your elbows attached to your body and arms instead of the shoulders and just move your body from right to left, around in circle, holding your elbows to your sides. Isn't that simple? Anyone can do that" (reproduced with permission from SOFA Inc., copyright owners of the Ed Sullivan Show). That was my first breakthrough, the first in a string of startling discoveries and coincidences that culminated in Henny Bogan the Body Swing Golfing Machine. It was a few months after the conception of Henny Bogan that I stumbled upon the final validation. It was a Ben Hogan quote from the book The Secret of Hogan's Swing by Tom Bertrand and Printer Bowler: “Life is too short to perfect one swing, let alone different swings to draw or fade the ball. We are creating a machine, your machine, where your hands are the chuck, and the club is the tool. If you want to work the ball, turn the tool in the chuck. Never alter the mechanics of your machine to alter the direction of the shot”. I am certainly not Ben Hogan, but like the Master, I too have a technical bent of mind. That is what drove me to the concurrent search for two swings - my own and that of the Master. As Hogan himself would have said, life is too short to perfect one swing, let alone two entirely different swings. But I took upon the challenge of learning, at the same time, both a Moe Norman kind of arms-driven swing and a Ben Hogan kind of body-driven swing. Any competent instructor will tell you that this is a recipe for infinite mind-and-body confusion. My two-pronged, study-practice endeavor was maddening all right, but it was also this five-year journey that led me to the Master's Secret and an appreciation of its radical difference to everything else in golf. Please visit my LinkedIn profile here for more details about me. DX : The fourth clue to the Hogan Code is on pages 98 and 99. Identify the hidden circle and trace the travel of its arc.